William Durkin grew up in the San Francisco Bay Area. He enjoyed and loved fishing in the rivers, lakes, bays and coastlines of the Pacific in northern California. When he was'nt in or on the water he was running around the Steinhart Aquarium. Then came the dams, the population boom, industrial farming and pesticides. The great fish that once thrived in those waters are only in old photos and memory. Those memories are served well in William's art. 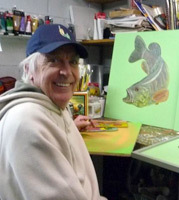 Self taught, his passion and love of all things fish have turned into a six year project called "The Fish Bait Motel." For the last twenty years he has been the owner operator of "The Gypsy Wolf Cantina," with his partner Jorge Perez.